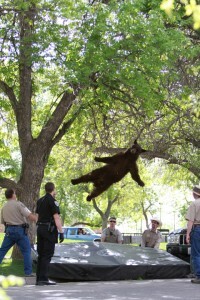 » trampoline Why Outrun The Bear? So, my blog i s called Why Outrun The Bear? but I saw a photo this afternoon of a bear that was falling out of a tree after being tranquilised and dropped to safety. However, to me it almost looks like the bear is on his way up from jumping on a Trampoline – what do you think?